A heartbroken mum has paid tribute to her son in the hope of reaching all of his friends in time for his funeral. Ben Roffey, 39, from Broadstairs, was found dead in King George VI Park in Ramsgate on Thursday, February 23. Police had been called to the playing field behind the café at 6.49am. Mum Sonia Cooper, her husband David and siblings Debbie, 36, and Sam, 32, were told the devastating news after police came to the family home, where Ben and his son Daniel also lived, in Westover Gardens at 10.30am that day. The family now face a gut-wrenching 10 weeks for postmortem tests to find out what caused the dad-of-three’s death. 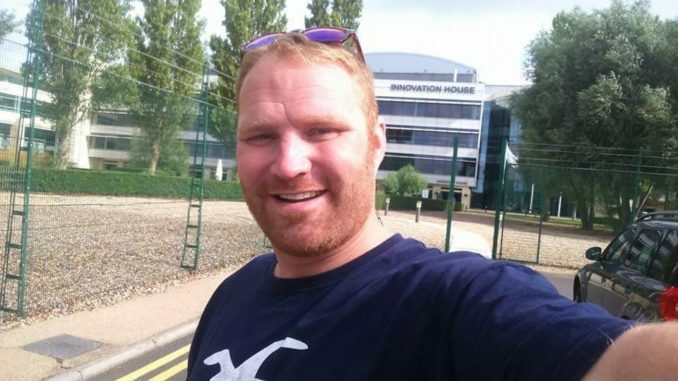 Sonia said: “So many people have been texting or messaging to say they are devastated that Ben is gone. “People loved him, they loved being around him. He was always happy and smiling and never showed other people when he had problems. “He was a big strong person to everybody but also had an utterly stupid sense of humour and a laugh I never want to forget. “Everyone has shown their love and care for Ben and devastation that he is not here. It’s been a big comfort to know that we are not the only ones who loved him and were proud of him. She said: “We need to know why he died. We have been told there will be tests that will take 10 weeks and then if there is nothing conclusive there will have to be an inquest. Ben, a former Conyngham pupil, had been getting help for depression and alcohol issues but had been well and happy in the weeks before his death, said Sonia. He was inseparable from his Staffy dog Mooge who he took on when a friend could no longer keep her. Sonia said: “He loved taking her out, they were always together. He always loved being out. Even when he was young, after we moved here when he was about 10, he loved going off to the arcades and would pack his rucksack and go off on his bike. A funeral service will be held on March 16, 10am at Margate Crematorium. A celebration of Ben’s life will follow at Lesters in Ramsgate Road, Margate. Anyone who would like to follow the hearse can meet at 5 Westover Gardens, St Peter’s at 9.15am.